In the bridal jewelry business it is comforting when you have someplace to go that has a history of customer confidence. Seventy five years of history shows a standard beyond excellence and it is the standard McCary’s Jewelers of Shreveport-Bossier City, LA has thrived upon. They have grown and changed with the times and are proud they have touched the lives of generations of customers. The new freestanding McCary’s Jewelers’ location offers the finest customer experience in the Louisiana retail destination of South Shreveport. Make a memory for life this Valentine’s Day at our Coast Diamond Retailer of the Week, McCary’s Jewelers of Shreveport-Bossier City, LA. There is nothing like a stylish Coast Diamond design, crafted with the highest of standards, to make this Valentine’s Day a memory for life. Whether you plan to propose or want to give her the most coveted gift this Valentine’s Day, a diamond band for stacking, McCary’s is thrilled to be a part of the excitement. Coast Diamond simple solitaire engagement ring (LC5388) with petite prong set diamonds on the band is accented with a peek-a-boo diamond underneath the center diamond. A beautiful beginning of the coveted stack of diamonds so popular today. The award-winning Coast Diamond cushion shaped halo wedding set (LC5410-RG) is set in rose gold with a white gold halo and double prong center stone setting. Stunning just as it is but take a peek at the many ways it can be customized by clicking here. The perfect Coast Diamond band (WC5191H) for the coveted diamond stack. Petite pavé set diamonds decorate the top of the band and it is finished with a milgrain edging. The perfect way to show her you love her this Valentine’s Day! Congratulations to McCary’s Jewelers of South Shreveport for being our Coast Diamond Retailer of the Week! Mystery and excitement are what makes Valentine’s Day romantic for a couple in love. While she may be expecting the proposal, we have the most romantic engagement ring that will surely be a surprise. For couples in love in Providence, Rhode Island the place to go for your romantic Coast Diamond engagement ring is M.R.T. Jewelers. They are the largest diamond and bridal ring retailer in all of Rhode Island. And even more impressive, they have been serving Rhode Island for 100 years. Coast Diamond is happy to call M.R.T. Jewelers of East Providence, RI our Retailer of the Week. If you are planning a proposal, something tells us you’re pretty romantic. The jewelers at M.R.T make it easy to find the most romantic engagement ring for your Valentine’s Day proposal. 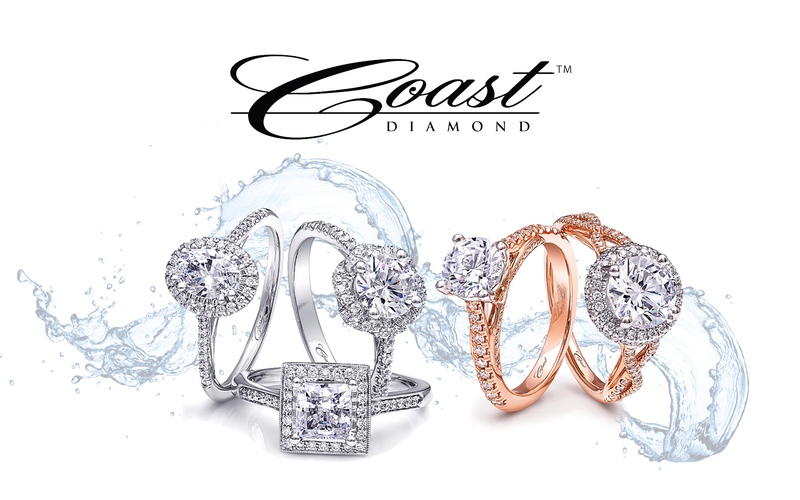 They focus on value without compromising quality and Coast Diamond is just the designer to meet those expectations. The countdown has begun with less than four weeks before Valentine’s Day. Our most romantic Coast Diamond engagement ring (LC10031) has everything a bride could dream of. The large 2CT diamond center stone (sold separately) sits in a double prong setting with over a half carat of diamonds dripping down the sides of the finger in a scalloped design. It is a gorgeous centerpiece in a stack of bands. The perfect compliment to the most romantic engagement ring is this Coast Diamond wedding band (WS20000) from the Romance Collection. It features one full carat of micro-prong set round brilliant diamonds set half way around the band. That’s more than three carats of diamonds on her finger! Our Coast Diamond Romance Collection is full of romantic surprises for Valentine’s Day. The Coast Diamond band is not just a beautiful finish to any wedding set, but it makes the perfect gift for the woman you love on any special occasion. Tell her how much you love her with this elegant and sparkling Coast Diamond band (WC20018) with two rows of round brilliant diamonds (0.84TCW) set with microprongs. M.R.T. Jewelers has direct access to the world’s finest diamonds and gemstones. They will break down the vital elements of choosing the perfect center stone to complete your romantic Coast Diamond engagement ring. You will be comfortable and confident in your purchase. Congratulations to M.R.T. Jewelers for 100 years of service in the fine jewelry business and for being our Coast Diamond Retailer of the Week! Valentine’s Day anticipation is building and the most coveted gift is a stackable diamond band. The exciting thing about stackable diamond rings is each stack is totally unique. Some mix old with new – diamonds with gemstones – rose gold with white gold. You can’t go wrong with a diamond band for Valentine’s Day. Whether she has a stack started or you buy her the first band (or two… or three), Coast Diamond has an incredible selection of unique diamond bands. Your Coast Diamond authorized dealer in Idaho is Simmons Fine Jewelry. For over 25 years Simmons has been helping couples “celebrate life’s occasions with fine jewelry that will be remembered”. This Valentine’s Day find the perfect stackable diamond band for your loved one at our Coast Diamond Retailer of the Week, Simmons Fine Jewelry in Boise, ID. For years now celebrities like Jennifer Garner (pictured above), Sara Jessica Parker, Kate Hudson, Jessica Alba (pictured above), Reese Witherspoon (also pictured above)… have been wearing stacked diamond bands. Some choose to stack them with their engagement ring… Some choose a stack of only bands… Some like a stack on whatever fingers they can fit them on. Diamond bands are all the rage today and Simmons Fine Jewelry guarantees it is THE perfect gift for Valentine’s Day. Coast Diamond band (LC2023AH) with brilliant round diamonds set in round and marquise shapes, finished with milgrain edging. Click image for details. Coast Diamond petite stackable band (WC5191H) of fine pave set diamonds with milgrain edging. Click image for details. Coast Diamond band (WC10183H) featuring a pattern of round and marquise shapes set with diamonds halfway around the band. Click image for details. Congratualtions to Simmons Fine Jewelry in Meridian, ID for being our Coast Diamond Retailer of the Week! Coast Diamond and Solid Gold Jewelers have something in common… the goal to ensure you have total control over the final design of your engagement ring. Every bride wants a wedding set unique to her and that’s why Coast Diamond creates engagement ring and wedding band designs to be personalized to your desire. With the skill and experience you get from Gerry Taylor and the staff at Solid Gold Jewelers we are confident you will create the unique Coast Diamond wedding set you dream of. That is why Solid Gold Jewelers of Normal, IL is our Coast Diamond Retailer of the Week. There really is no way to go wrong when creating a wedding set these days. Each Coast Diamond engagement ring and wedding band is completely customizable. Whether you choose to go with the color of the moment… rose gold, stick with the staple… platinum, or mix metals, Solid Gold Jewelers has been helping Coast Diamond brides make stunning creations. The solitaire diamond engagement ring is the perfect foundation for a unique wedding set. This Coast Diamond engagement ring above (LS10005) has a 1CT center stone and can be customized in rose, yellow or white gold, or platinum. You can even mix them… a rose gold band with white gold prongs for the diamond center stone looks amazing. For a larger stack, like the one in our featured image, choose a larger diamond center stone for your engagement ring. For the bride that loves a surprise and a little extra sparkle, the Coast Diamond engagement ring (LZ5001H) with a hidden diamond in the gallery is a perfect choice. The graduated diamonds on the band of the cathedral setting is gorgeous. Finish the set on your wedding day with the matching 3/4CT diamond wedding band (WZ5001H). A Coast Diamond band is the completion of the Coast Diamond wedding set. This Coast Diamond band (WC5257), with almost 1/3CT diamonds, finishes any Coast Diamond wedding set beautifully. Take a peak at our entire collection of wedding bands before you create your unique wedding set. Congratulations Solid Gold Jewelers in Normal, IL for being our first Retailer of the Week for 2018!